Week 17 is usually a crapshoot in the NFL, kind of like how Week 1 is. We never know for sure how good teams are going to be, so there are many uncertainties in season openers. Equal to that -- for different reasons -- is Week 17. The end of the season brings a lot of different approaches. Some teams go all out, trying to end the season on a winning note. Others play like they just can't wait to clean out their lockers and move on to the next year. For other teams, Week 16 is the time to start playing out the string. Among those would be the Indianapolis Colts. At 14-0, Colts management -- led by team grand poobah Bill Polian and rookie head coach Jim Caldwell (in the photograph) -- faced a dilemma. Go for the unbeaten season, maintain a rhythm for all your starters, or sit the important players, assuring their health for the playoffs? By now, you know what the Colts did. They took quarterback and MVP favorite Peyton Manning out of Sunday's game with the Jets, leaving a 15-10 game in the hands of rookie Curtis Painter. The bug-eyed youngster quickly turned 15-10 into 29-15, and the Colts had their first loss. Meanwhile, teams like Green Bay have a decision to make this week. The Packers can't improve their playoff position, no matter what they do. They're a wild card team, they're going on the road for the first round, and it's likely they'll have to win three road games to get to the Super Bowl. Sunday's Week 17 game is meaningless. What should they do? For the Packers, it should be obvious. You do what the Colts did. Guys like Aaron Rodgers, Ryan Grant, Greg Jennings, Donald Driver, Jermichael Finley, Chad Clifton, Mark Tauscher, and Charles Woodson start, play a few series, then depart for a cozy seat on the bench. Why is this so obvious, while what the Colts did was so obviously wrong? To start, recent history works against the top seeds. Last year, only Pittsburgh, San Diego, and Arizona won home playoff games. AFC top seed Tennessee and the NFC's top seeded Giants both were one and done, losing to their respective conference's sixth-seeded teams, both of whom had upset division champions on the road the previous week. Furthermore, the Colts have done this dance before, only to be met by an epic fail in the playoffs. The last two times Indianapolis secured a first-round bye, they were ousted in the divisional round by a road underdog. In fact, Peyton Manning is now 0-3 in his career in the divisional round after a first-round bye. In all three situations, the Colts half-assed their season finale and lost. This time around, the Colts decided not to wait for their season finale. They half-assed the 15th game, will almost assuredly do it again Sunday in Buffalo, and could go into the playoffs on a two-game losing streak. There have been 43 Super Bowl winners. Many of them have been non-descript, except within their own franchises. Once the list hits 50 in a few years, it will become more and more watered down with forgettable figures. The 1972 Dolphins are unforgettable. The 2009 Colts no longer have an opportunity to be unforgettable. Yes, the objective to win the Super Bowl is a noble one. Everyone wants to do it. But given the way the playoffs have unfolded over the last few years (No. 1 seeds have not battled in a Super Bowl since New England-Philadelphia in 2004), don't you owe it to your fans to have a little momentum heading into the tournament? Speaking of the fans, how mad are you today if you're a Colts season-ticket holder? It's bad enough to think that your team basically threw a game in front of you, but how about the fact that they're throwing your money away? Let's say a good season ticket for Lucas Oil Stadium costs $750 (arbitrary figure, I know). Two of them (since you're not sitting alone) will run $1500. You're buying tickets for two games (preseason) that don't count and won't be taken seriously by anyone. Now, a third game has been thrown away by your team, since they are afraid of getting any good players hurt. That means that 30 percent of your season ticket money will have gone to tickets for games that the home team isn't trying to win. Doesn't that make you question your investment a bit? I mean, if they're not trying to win, what the hell are you doing spending so much money on the game? What fun could it possibly be to watch the home team go through the motions, especially against a team desperate to win? As much as you have to respect the Colts for what they've accomplished, it's easy to see why people respect the Patriot way more. With an unbeaten season in their sights, New England played their 2007 season finale like it was the most important game of the year, even though home field had been clinched for weeks. Guess what? No one was seriously injured, everyone was entertained, and the Patriots won. It's too bad, for the sake of everyone who likes football, that Indianapolis didn't treat history with the same reverence. Maybe they could have finished the job that New England didn't. When you're looking at a schedule of 13 regionally-covered NFL games in a weekend, it's easy to imagine that some of the announcing will be less than stellar. However, it's hard to imagine there being a worse broadcast team in the NFL right now than the Thom Brennaman/Brian Billick combination on FOX. They're probably the fourth or fifth team on the network, meaning they rarely call big games. However, since I have Sunday Ticket, I've witnessed their magic a few times. Rarely were they in better -- or worse, I guess -- form than Sunday at Lambeau Field, when Seattle faced the Packers. Brennaman and Billick were at their best worst late in the first half. Facing a third and goal at the 15, Green Bay ran the clock down to 15 seconds and took their second of three timeouts. That meant they had one timeout left (simple math, but follow along, please). It was going to be third down and goal, meaning they couldn't get a first down without scoring a touchdown. There were no more than two plays left in this possession, barring an unlikely series of defensive penalties, yet Brennaman and Billick were aghast at Green Bay's clock management. Why, they wondered, would the Packers run so much time off the clock? After a 14-yard pass to Jermichael Finley, it was fourth down and goal at the one. The Packers called a timeout with eight seconds left. Brennaman and Billick again talked about the clock management, curious as to exactly why Green Bay would do such a thing. After a touchdown pass was called back by a penalty, there were still three seconds on the clock. Since the penalty -- which was a bad call -- moved the ball back to the 11, Mason Crosby booted a field goal on the last play of the half. Normally, I try to leave announcers alone. In fact, I tend to be kind of sensitive to criticism of them, because I know how hard a job it is to do. However, this is one of those stories that simply can't be brushed aside. Billick wins points with me because he can poke fun at his coaching failures, especially when it comes to developing quarterbacks in Baltimore. That's all well and good, but the guy is clueless in the booth, and Brennaman isn't much better. The worst thing that could have happened to the Packers was that they would turn the ball over in that sequence. Outside of that, they were going to have a chip shot field goal if they didn't score a touchdown. What would the purpose be of leaving extra time on the clock for Seattle to respond? There's no reason to let a bad team back in the game with a late score, especially when that bad team is scheduled to get the ball for the start of the second half. For Brennaman and Billick to fail to recognize the nature of the situation -- which was that Green Bay was in goal-to-go and couldn't get a first down -- is inexcusable. Luckily, Mike McCarthy has a better understanding of clock management than these two clowns. Unfortunately, that isn't saying much. Hope everyone had a great holiday. Regular posting resumes this week. Well, as regular as we get around here. Third-year pro Mason Raymond continues to impress for Vancouver. The former Bulldog is up to 17 goals after a huge first period Sunday night in Calgary. Against the rival Flames, Raymond posted his first career hat trick, and he did it the natural way. His three-goal outburst in the first period gave Vancouver a 4-1 lead, and before he chased Flames netminder and Finnish Olympic hopeful Miikka Kiprusoff, Raymond embarrassed the star a little bit. Watch this incredible goal. Oh, and it's not necessarily the good kind of incredible of you're a Flames fan. Vancouver won the game 5-1. In just 39 games, Raymond has set career highs in goal (17) and points (29). It's been a great start for him so far. Also, former Bulldog Michael Gergen is playing professionally in Salzburg, Austria. In a message last week, he told me he's enjoyed his move to defense. I have invited Gergen to put together a guest blog for us when he has time. Even though he was sent to the minors not too long ago, former UMD Bulldog MacGregor Sharp is continuing to turn heads. This time, it's NHL.com noticing the rookie, now playing with the AHL's San Antonio Rampage. Lindsay Kramer authors this feature. In it, we find out that Sharp was recently told to get an apartment in San Antonio, so he won't have to live out of a hotel anymore. This is a really good sign for him, as you could probably ascertain. Anaheim had its antenna pointing in Sharp's direction from early in his senior season. Even though the player had done little to merit more than a passing nod, the Ducks were already checking up on him. "He's just a kid who got more opportunities to play at Duluth, and he got more confidence," said David McNab, senior vice president of hockey operations for Anaheim. "It was easy to like him." Very quickly, he was easier to love. Unless you were trying to shut him down. Sharp scoffed at precedent and laughed all over the score sheet. He showed up at school his senior season with an improved shot and compiled 26 goals (second in the nation) and 24 assists in 43 games. "I just decided to come in as a fresh start, was really motivated to put up some numbers," Sharp said. "I definitely didn't think it was going to work out that well, but we had some good guys around us. It was a pretty special year. You are having the time of your life with some of your best friends." That was just the window dressing, since Sharp had yet to produce in clutch moments for a team that was a stranger to big games. But he blew away that concern by helping his school win the WCHA tournament with a hat trick in the Final Five title game. In seven postseason games (including two in the NCAA tournament) Sharp came up with 6 goals and 3 assists. "It wasn't pressure for us," Sharp said. "We were having fun with it. When you are having fun, you don't really feel any pressure." Sharp's fan club was growing exponentially by now, and NHL scouts pitching free-agent deals were at the front of the line to apply for membership cards. But Sharp, recalling the Ducks' overtures before he literally became "Mr. Big Shot," took a pact from Anaheim. "Obviously, Anaheim was my first choice," he said. "When they are there the whole way, they speak to you a lot. It shows you are doing something right." Obviously, this is great for Sharp. It's also good for UMD. Any time the program is mentioned as a potential development tool for pro prospects, it's good for recruiting. People notice these little things as they are preparing to make a college choice. Not only that, but it's nice to see people you watched play for four years succeed at the next level. You should be proud. There hasn't been one negative word written about Brett Favre in this space in months. Or weeks. Whatever. Anyway, the season has been going great for Minnesota. They have won the NFC North with two games to spare, and they still have a shot -- at least mathematically -- at the top seed for the NFC playoffs. Considering that the widely-held view of head coach Brad Childress is one of pure incompetence, this is a hell of an accomplishment. Favre's been a big part of that. He's limited his mistakes, thrown the ball with great accuracy, and there have been no complaints about his ability to blend in with his team. Of course, when you're winning, no one really complains much about anything. It's when you lose that such things happen. Sunday night, the Vikings got stomped, 26-7, by the lowly Carolina Panthers. In the midst of that loss, Childress and Favre appeared to have a bit of a spat on the sideline. We found out after the game -- from the notoriously bigmouthed Favre -- that the spat was the result of Childress trying to take Favre out of the game. Sounds like Favre politely told his coach to eat it. Virtually every football media outlet had a story Monday about Childress trying to pull Favre from Sunday's game, and it wasn't long before other examples were drawn up of this happening. Not only that, but it sounds like Favre's public acknowledgment of Sunday's events didn't sit too well with the bearded head coach. Sean Jensen of the St. Paul Pioneer Press notes that this isn't huge news at Winter Park. But all is not well between Brad and Brett, and the primary difference centers on the quarterback's penchant to check out of runs and into passes. According to one team member, Favre has expressed frustration for much of the season about Childress' unwillingness to let him audible more. And you all thought Packer fans' "It's all about Brett" mantra was just sour grapes. It is all about Brett. He wants to throw the ball. Handing off is boring. Favre might not care about the fact that he owns the NFL's all-time record for touchdown passes, but he sure seems to enjoy adding to that mark at every available opportunity. Meanwhile, Childress wants a quarterback that runs the called play. He knows he can't handcuff Favre, because Favre will simply go back to the farm, and then it's Childress -- not Favre -- that has the egg all over his face. But it is driving him to the point of frustration. To make matters worse, teams are playing more coverage against the Vikings, because the offensive line isn't blocking as well as it did earlier this season. That means Favre has to hold the ball longer than he should, and it opens him up to sacks and hits he shouldn't be taking. All might not be well in Minnesota, but let's remember that they're still on track for no worse than the No. 2 playoff seed, meaning they will play any NFC playoff games indoors, and they play the Bears on Monday night. ESPN will try to build up this storyline (just like they did with the schism story before an ESPN-televised Vikings preseason game), and Childress and Favre will destroy it by being on the same page during the game. This story can go away just as quickly as it showed up, because this team is still 11-3, and it's hard to sneeze at that record. For many years, teams in the National Football League did a terrible job of considering minorities for high-level football positions, whether it were on the coaching staff or in the front office. Call it whatever you want (coincidence, racism, overblown, etc. ), but it gave the league a bit of a black eye. After all, a good chunk of NFL players are minorities, and many of them had the desire and smarts to get into coaching. The league's well-intentioned way of getting more opportunities to deserving minority candidates was something called the Rooney Rule. Named for Steelers patriarch Dan Rooney and his family, the rule requires NFL teams to interview minority candidates for head coaching and major front office positions. The teams aren't required to hire any minorities, but must interview them before moving forward. In many ways, the rule has done a lot of good. No one will ever know what opportunities would have been available for guys like Raheem Morris, Mike Singletary, Jim Caldwell, Perry Fewell, and Lovie Smith were this rule not in place, mandating that they at least get a chance to interview. However, the rule has its flaws, as evidenced by a few hires over the years, as well as one that took place on Thursday. The Washington Redskins finally made a change atop their football food chain. Executive vice president Vinny Cerrato stepped down Thursday morning, and he was replaced by former Buccaneers and Raiders executive Bruce Allen. Allen is white, and while ESPN's Adam Schefter reported that the team interviewed two minority candidates to comply with the Rooney Rule, there is an issue with Allen's hiring. The issue is that it's likely the Redskins had no intention of hiring a minority candidate. Allen, who is the son of legendary former Redskins coach George Allen, is the guy they wanted, and they simply conducted two token interviews to make sure they were in compliance. Given Allen's history with former NFL coach turned commentator Jon Gruden, it seems a slam-dunk that Gruden will join the franchise as head coach next season. Of course, the Redskins will face a heavy fine from the NFL if they go through with that hire without conducting any other interviews. However, why would you agree to be interviewed for a job you have no chance at? Sure, you could blow the organization away, but what are the odds that it would matter? 100-to-1? The Lions were fined for hiring Steve Mariucci, but they only hired him after two minority candidates turned down interviews. They turned them down because they knew the Lions wanted local boy Mariucci to coach the team. Listen, I'm all for more diversity in football management. It's a problem, and it needs to go away. The NFL can do without the perception of racism in its franchises. That said, the Rooney Rule goes too far. There are teams that go into a hiring process with an open mind. Others aggressively pursue one desired candidate from the start, and that's okay. There is no exact science on hiring the right coach, because both the open- and closed-minded approaches have worked and failed. The league has made a lot of advances in this area, but it needs to get back to allowing teams to make hires they want, if that's how they want to roll. After all, no one whined when the Colts hired Tony Dungy and Jim Caldwell without conducting any other interviews, did they? The Green Bay Gamblers of the USHL play their home games in the newsy Resch Center, which is across the street from Lambeau Field. While not everyone in the league is on their way to a Division I scholarship, many USHL players have already committed to U.S. colleges, or they will commit before their junior careers are over. It was a rather unique experience for the Green Bay players on Tuesday, as the Gamblers hosted Cedar Rapids (Iowa). No, it's not that they haven't played Cedar Rapids before. Instead, it's because the game was delayed when a bat started flying around the ice surface. Instead of trying to slap it out of the air, ala Manu Ginobili of the San Antonio Spurs, Gambler players started swinging their sticks at it. Eventually, they were "successful." Video comes from Fox 11 television in Green Bay. You can expect a phone call from PETA very soon, Gambler management. Of course, the part of our world that doesn't hang on the life of a wayward bat sees at least a bit of humor in a bunch of hockey players trying to take out a bat with their sticks. The last time veteran broadcaster Gary Thorne had the chance to call a hockey game, he had a pretty good one unfold in front of him. That was the 2009 Frozen Four title game, a great comeback win in overtime for Boston University, and Thorne absolutely nailed it. The problem with Thorne is that he works for ESPN. No, this isn't some kind of anti-ESPN diatribe. However, the Frozen Four is really the only hockey ESPN has coverage of. Makes it hard for Thorne to work in the sport he's best at. Thorne has signed on to broadcast Team USA's games at the 2010 IIHF World Junior Championships for NHL Network. A holiday-season tradition will return to the NHL Network-U.S. for the third-straight season, as once again the network will broadcast all of Team USA's games at the 2010 World Junior Championship. Gary Thorne, Dave Starman and Fred Pletsch will be the broadcast team for the tournament, which runs Dec. 26-Jan. 5 in Saskatoon and Regina, Sask. Good deal for hockey fans. Matt McConnell did a good job on this last year, but he's now the full-time TV voice of the Atlanta Thrashers. Thorne here is a no-brainer choice. Few can call a hockey game with his acumen or enthusiasm. He's the only one on the planet close to Mike Emrick's league at this point. Hockey rules in Canada. The sport is revered in a way it will likely never be in the United States, and they take it quite seriously. The 2010 IIHF World Junior Championships are coming to Saskatchewan starting next Friday. This past weekend, top candidates for the Canadian team gathered in Regina for a tryout camp. For many youngsters, the first real big-time hockey dream they have is the chance to help Canada win the World Juniors, a tournament that has gained significant prestige in recent years. Coming off a stirring gold-medal win last year in Ottawa, Hockey Canada is looking to form another elite team of youngsters for this year's tournament. Among the candidates at their weekend camp were UMD freshman Dylan Olsen and Denver sophomore Patrick Wiercioch (pictured). Both had to forgo the chance to play in Saturday's series finale in Duluth to fly to Regina for the camp. While Olsen got on the ice and was given an opportunity to impress the brass who are putting the team together, Wiercioch never saw the ice. A knee injury Wiercioch suffered last month didn't keep him out of the lineup for long, and it didn't prevent him from practicing with the Pioneers for most of November into December. However, Canadian officials determined that the knee wasn't good enough for Wiercioch to try out, and he was cut without actually getting a chance to make the team. "Our medical staff had been in direct contact with their medical team over the past four to five weeks," (DU coach George) Gwozdecky said. "They were very aware of not only his injury, but how it was diagnosed and treated, and obviously the fact he had been practicing and playing. It's very surprising they would bring him up there and decide to not clear him." A frustrated Gwozdecky added: "They have no different diagnosis than we do. I think the bottom line with them is: They had 11 or 12 defensemen, and like it or not, this is probably an easier way to whittle the group down to six or seven. We all knew Patrick is not 100 percent healthy." As Mike Chambers points out, Wiercioch played in Friday's game against UMD, and he was never given any indication that his injury would keep him from having a realistic shot at making the Canadian team. Let's face it: This was an awful move by Hockey Canada. There is no reason to take a kid away from his team if you're not certain you are going to let him try out. That means you either trust the doctors DU is using, or you send him for an independent opinion in Denver the week of the tryout. You don't fly him to Regina, prevent him from playing in a big game for his team, and then tell him his World Junior dream is dead. The well-respected Gwozdecky is likely correct. This was the easy way for Canada to knock that high number of defensemen down without making any difficult decisions. If that's the case, it's all the more reason not to waste everyone's time and energy flying Wiercioch to Regina. 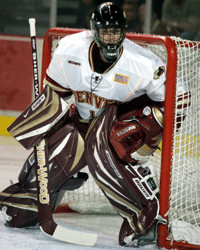 On the bright side for Denver, the big defenseman now gets two weeks to rest that balky knee before the Pioneers host Nebraska-Omaha Jan. 1 in the Denver Cup. With the winter meetings amping up free agency in baseball, the pitching-starved Milwaukee Brewers got busy last week. Knowing they had to fill at least two (maybe up to four?) spots in the starting rotation, general manager Doug Melvin used the decision not to bring back Jason Kendall or Mike Cameron to free up money for pitching. Though more is expected out of the Brewers before they send pitchers and catchers to Arizona for spring training, here is a quick recap of what they have done so far. Wolf has been a solid starter for a few years. However, he's 33, and he's been known for giving up gopher balls on occasion. His overall numbers are decent, and the contract is only three years at under $30 million. In today's world, that's not a terrible deal for a potentially overrated pitcher. Wolf is left-handed, and if he can keep the ball in the yard, he should do well in Miller Park. Having him signed up to the age of 36 is a bit disturbing, but this just can't be considered a bad deal. If nothing else, he has more upside for less money than Jeff Suppan had in 2006, when he started stealing money from the Brewers. However, I understand fans being cautious about this. After all, the Brewers struggled so much with their pitching last year that virtually anyone would make for a good signing. Outside of Todd Coffey, the Brewers were lacking of guys who could help set up Trevor Hoffman, or maybe fill in if the veteran closer needs a day off. As this team has seen plain as day in recent years, you can never have enough short relievers. Reality is that guys like Coffey can be as durable as can be, but they will break down and struggle if they're asked to log too many innings in a short period of time. That's the reason for signing Hawkins. Yes, he's a bit old. Hawkins is going on 37 years old, but he's been decent in recent years. He threw in 65 games for Houston last season, posting a very impressive 2.13 ERA, and generally keeping hitters off the bases. He also posted 11 saves, showing the ability to, yes, fill in for the closer if need be. Rivera wasn't a surprise. He's a replaceable backup catcher who can hit a little bit and isn't a high-value player. Not only that, but he's 33, so he has virtually no hope of getting better. McClung, on the other hand, was. It seemed like he was the kind of guy who would do anything the coaches told him to. He pitched as a starter, a long-relief guy, and even a setup man. While he was inconsistent in 2009, he has a big arm, was a popular player, and seemed to have a future as a utility pitcher in Milwaukee. There were issues between McClung and manager Ken Macha. Without placing blame, it's clear that McClung didn't get along with the skipper, and he would have every right to think that frosty relationship cost him any chance of returning. The Brewers could have forced the two to make nice. Instead, they got rid of the guy they may have perceived as a problem. The real problem, however, will come when it's time to fill his role. The team still needs a couple starting pitchers, and they could use a bat or two to come off the bench. All in all, though, it's been a good start to the winter for Melvin. With apologies to the great Peter King, here are some quick-hit thoughts on the NFL as we hit the end of Week 14 Monday night. The Eagles are dangerous. Between athletes like DeSean Jackson, LeSean McCoy, and, yes, Michael Vick, Andy Reid has more toys on offense than he's ever had before. Even if Brian Westbrook doesn't come back this season, and if Jeremy Maclin's foot injury is worse than they fear, Donovan McNabb has a lot to work with heading into the playoffs. Now, we just have to wait and see if Philadelphia can play better defense than they did Sunday night, when Eli Manning carved them up pretty good. When January rolls around -- and it's coming quicker than you may think -- they have to find a way to stop people. Having Asante Samuel and Sheldon Brown on the outside helps. Oh, and Reid's whatever-that-was with Jackson Sunday night was hilarious. He's clearly having fun with this team, and even for a straight-laced coach, that's half the battle. The Packers might be. It's hard to tell -- even after 14 games -- who the Green Bay Packers are. The adjustment to a 3-4 scheme seems to have benefited the defense, which continues to make plays and slow offenses down. However, the Packers haven't faced a top offense in some time, and they got decimated by Brett Favre when that happened. Is what you're seeing now a product of the players making the necessary adjustments and understanding the new defense, or is it simply a decent defense going up against crappy offenses? As it stands, the Packers are staring down the barrell of McNabb or Kurt Warner in the first round. If they're lucky enough to win that game on the road, here comes Favre or Drew Brees in the divisional round. In short, anyone who thinks this is a darkhorse Super Bowl contender is delusional. If you're the Vikings, who do you want to avoid? Assuming the Vikings hold on for a first-round bye, which isn't a guarantee, they are not likely to enjoy the divisional round. The potential opponents include Philadelphia (knocked them out last year and they're better this year), Arizona (already thumped the Vikings once), and Green Bay (division rival, emotional feud). The Packers might be the most desirable opponent. The Vikings won both games handily, with neither game's final score being at all indicative of how the game was played. The Vikings will likely have to beat the Saints in New Orleans to get to the Super Bowl. That said, the divisional round will be no picnic, unless the Vikings get really lucky and get to play the Cowboys or Giants, neither of whom will do much to stay competitive against Minnesota. No matter how tough their road may become, the Vikings are playing like a favorite in every way. They've exhibited offensive balance, they have great pass protection, they are rarely out-physicaled (yes, I know that's not a word), and they can do it all on defense. To beat them, you need them off their game, or you have to beat them at their best. Regardless of what you think of Brad Childress, it's hard to imagine a veteran team like this being off their game in the playoffs. No, 16-0 isn't more important than a title. That's just ridiculous talk. However, teams need to look at the past history. As King noted in MMQB this week, the top two AFC seeds are just 3-5 in divisional games the last four years. Last season, neither team in the NFC to earn a first-round bye won in the divisional round. Not only that, but the Cardinals -- twice -- were the only NFC team to win a home playoff game last year. No, you can't blame this fact solely on teams resting starters when they already have a bye wrapped up. Every time a top team suffers an injury in Week 17, as Ben Roethlisberger did last year, the question of "Why is he even in the game?" comes up. That kind of media and fan pressure makes it tough for coaches to do the right thing. Healthy players need to play. You can't simulate game speed in practice, no matter what you do. Plus, imagine the outcry if you actually simulated game speed in practice, only to have a top player suffer an injury. This is football. Guys get hit, and sometimes they get hurt. However, athletes are extremely regimented. Taking them off their normal routine for a bye week is hard enough. Adding to that the potential of one or two more bye weeks is only going to make it more difficult for those players to get back in rhythm when the games resume. Especially when those games count more than any other. The pressure of winning home playoff games is bad enough, without players being asked to get back in game shape on the spot. These teams are both good. They're both legit. Now, it's time for UMD to show that they're capable of being just a little better. The Bulldogs need to come out, play with some crust, as Edmonton coach Pat Quinn would say, and get in DU's faces. Some changes for tonight, so here are the lines. Wrenn (upper body) is going to be a game-time decision. Brookwell will play if he can't. Phillips is in for Patrick Wiercioch (World Junior tryout). For UMD, Dylan Olsen is also gone for the World Junior tryout. He has just one goal this season for the Dallas Stars. He had never been called on in a shootout during his three-year NHL career. But former Bulldog Matt Niskanen took advantage of his opportunity Friday night. In San Jose, the Stars got a third-period goal from Brad Richards to tie San Jose 2-2. The game went scoreless through the rest of regulation and a five-minute overtime. That necessitated a shootout. The shootout saw each team score during the regular three-round period. That sent us to sudden death, and nothing happened. For seven straight rounds, goalies Marty Turco and Evgeni Nabokov dueled, making great saves (with Turco throwing in a couple nice pokechecks on Shark shooters who wanted to deke him). Heading into the 11th round, Stars coach Marc Crawford called on Niskanen, who has plenty of offensive ability, as proven in high school at Virginia/MIB and in college at UMD. It proved to be the game-winner, with Turco making one more save to seal the 3-2 shootout win. This should be a great series. Running behind on virtually everything, so here are the lines. 16 games down in the 2009-2010 season, there are a few certainties with the UMD men's hockey team. They can score goals like crazy. UMD has four of the top point producers in the country interspersed over their top two lines. They have character. UMD doesn't fear a deficit, and they do not quit. There are still some questions about their ability to play 60 minutes. It's no longer about, "Boy, if they can play like that again next weekend, they might have a chance." UMD has officially crossed into dangerous territory. Expectations. Instead of hoping for a split last weekend, fans wanted more. They were disappointed with the second-period lapse that likely cost them Friday's game, and they weren't happy with the overall effort through two lackadaisical periods on Saturday, at which point UND led 2-0. There is something about this team. They just keep plugging away. Starting with around 7:00 to play in the second period Saturday, the tide changed. They were stringing good shifts together. They started hitting people. They were moving their feet. When Kyle Schmidt buried a rebound at 1:15 of the third period, the comeback was on. UMD outplayed North Dakota in every facet of the game over the final 27:00 or so of regulation, and they deserved what they got with :34 to play. That was when Travis Oleksuk found the puck at the side of the net and tucked it around the goalpost for the game-tying goal. We all know what happened from there. The split was an important one for UMD. They stayed above the home-ice line. They are now more than halfway to the typical number of points (28) that it takes to earn home ice. Now comes a bigger test. As good as North Dakota is -- and they're good -- Denver is better at this point. They're deeper and faster up front, and they're better in goal. Guys like Drew Shore and Shawn Ostrow give the Pioneers depth along all four lines, something they haven't been known for in the past. Meanwhile, the main cogs (Rhett Rakhshani, Tyler Ruegsegger, Jesse Martin, Joe Colborne) are still scoring, too. Defensively, they're good with the puck, and they push the tempo. Patrick Wiercioch might be the best defenseman in the league, especially with Chay Genoway hurt. Now you can throw top-notch youngsters William Wrenn and Matt Donovan in the mix, too. Of course, if you get through all that, you have Marc Cheverie in goal. In reality, the Pioneers are a great opponent for UMD. This should be a great weekend of hockey. You'll see some hitting, plenty of skating, some high-tempo hockey, and goaltending. The Bulldogs have to bring their best effort for 120 minutes, because Denver is too good to let up against. For UMD to get points this weekend would be huge. It would be a boost for the team's profile, and it would send an emphatic message to the league that this team is for real. Of course, we already know that. Baseball's winter meetings are wrapping up in Indianapolis. While some teams are making trades, and others are signing players to hugely expensive contracts, younger players are preparing for a first shot at the majors. One of the ways the kids get said shot is via the Rule 5 Draft, which was held Thursday. The draft is meant as a way to keep teams from stockpiling young players in their farm system without ever giving those kids a reasonable shot at the bigs. Teams that select players in the Rule 5 Draft have to keep the player on their major-league roster for the entire season. If they don't, they have to sell the player back to the team they were drafted from. For former Duluth Denfeld Hunter Ben Jukich, Thursday's selections may be his big break. After spending the entire 2009 season in the Reds' farm system, he was picked by the St. Louis Cardinals. The Cardinals seem to like Jukich's potential out of their bullpen. "The idea is that he could be anything, really," general manager John Mozeliak said. "He's someone who can pitch more than an inning. He has been used in the past as a starter. He gives us some flexibility. "He's had success, and whenever you're looking at someone that might have to be used as a left-handed reliever, we felt that he had a good enough breaking ball to survive. But more importantly, when you think about the Rule 5, if you are having to carry him, he's got to be able to get more than just one out." If Jukich doesn't stick with the Cardinals, he has to be offered back to the Reds for half of the $50,000 St. Louis paid Cincinnati as part of this selection. In the meantime, we salute Jukich. You don't hear much about local players getting a shot in Major League Baseball, so we hope for the best. Former UMD Bulldog Andrew Carroll left behind quite a legacy. He was rarely seen in a UMD uniform without the letter "C" or "A" on the front of his jersey. Leadership skills like his are not common at any level of hockey, and his tenacity on the ice masked the obvious skill that helped get him recruited in the first place. Since leaving UMD, Carroll has hooked up with the ECHL's Charlotte Checkers. After an impressive start to his season there, he has received an opportunity to move up in the hockey world. Wolf Pack general manager Jim Schoenfeld announced today that the team has signed forward Andrew Carroll to a Professional Tryout (PTO) agreement. Carroll, a rookie out of the University of Minnesota-Duluth, comes to the Wolf Pack from the team’s ECHL affiliate, the Charlotte Checkers. In 16 games with the Checkers, the 6-0, 200-pound native of Shoreview, MN scored eight goals, good for a tie for third on the Charlotte club, and added four assists for 12 points, along with 30 penalty minutes. It's hard not to root for a guy like Carroll, who was known as the quintessential "first one on the ice, last one off" guy at UMD. He was also insanely popular off the ice, and no one will ever forget the emotions he showed on the ice both during his last game at the DECC and after Miami eliminated UMD from the NCAA Tournament last year. Here's hoping "Ace" finds even more success in the AHL! I haven't been invited to vote for the Heisman Trophy. Part of the reason for this may be that I panned it the H*i*m*n for years after Larry Fitzgerald was somehow denied. Anyway, The Blue Workhorse is compiling votes for a "Sports Blog Heisman," and I have decided to take part in the balloting. It is a tough year to pick a favorite. There are a plethora of candidates from all over the country, and the guy everyone thought would win it (Tim Tebow) is not among the most serious. Neither is the guy who won it last year (Sam Bradford). We don't even really have the Token Guy From A Smaller League Who Should Be Considered But No One Will Vote For. What do we have? We have some great running backs, a quarterback who has had an unbelievable career, and a defensive tackle who should get a serious look. 3. Ndamukong Suh, DT, Nebraska. He's easily the most dominant defensive player in college football. 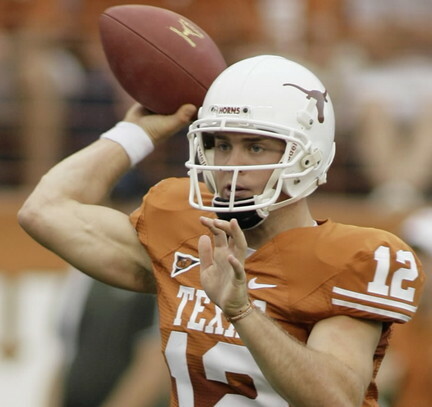 He owned Colt McCoy in the Big 12 title game. The bottom line is that this is the kind of player NFL scouts drool over, and he's a game-changer in the same way the guys like Tebow and McCoy are. 2. Mark Ingram, RB, Alabama. As good as Suh has been, Ingram moved ahead of him on my ballot with his performance in the SEC title game. The way he owned the Florida defense all night was very impressive, and he is the kind of player who can lead his team to a national title, even without the presence of an elite passing game. The human interest story with Ingram and his jailed father is touching and could sway a few human voters. 1. Toby Gerhart, RB, Stanford. Stanford was nothing when Gerhart arrived, and no one really knew much about the horse of a running back. This isn't about career achievement, though. Gerhart found the end zone 26 times this season, despite being the focal point of every defensive game plan he ran into. He was only held under 100 yards twice, and he never stopped taking the ball from quarterback Andrew Luck. It's odd to think that a guy on a four-loss team could win the Heisman in this day and age, but it's not been a normal year for college football. By now, you're all aware of my feelings on the current setup in college football. I like the bowls, and I strongly feel they can give us some really entertaining football games during the holiday season. At the same time, I find it patently insulting that we still don't have a national tournament to decide a football champion. This was kind of cute back in like 1990, but almost 20 years later, we're no closer to a playoff system than we were when Tom Osborne was roaming the sidelines at Nebraska, and Wisconsin's football program really sucked. 33 bowl games are lined up and ready to go for this year. Yes, that's too many, however, it does allow some quality football players a chance at national exposure that they wouldn't normally get. Plus, it's extra college football, and it's hard to argue with that. The bowl season begins Dec. 19, as Wyoming and Fresno State hook up in the New Mexico Bowl. There will be at least one game virtually every day from there until the national championship game, which pits Texas against Alabama at the Rose Bowl in Pasadena. There are intriguing matchups all over the place, and there are compelling reasons to watch every game. Want proof? Here you go. Fresno State running back Ryan Mathews should have a field day against Wyoming's horrific run defense. It might be a home game for UCF, which is located in not-far-away Orlando, but Rutgers has the edge at all the skill positions. It will be up to the Golden Knights' tough defense to keep them in it. Basketball score, anyone? USM's wacky, fast-paced attack faces well-known spread guru Tony Franklin, who is in his first season as the Blue Raiders' offensive coordinator. This could be one of the best running back duels we see in the bowls. BYU has Harvey Unga, while Oregon State counters with the shifty and insanely fast Jacquizz Rodgers. Both teams struggled mightily against top-tier foes this year, and both are coming off disappointing season-ending losses. It should be a good matchup, as they're looking to prove themselves and set up for bigger things next season. Things could get interesting in this game. Nevada has been running people over for weeks, and they have three (!) 1,000-yard rushers. SMU, meanwhile, is still rebuilding under June Jones, and while they have had a nice season, it could be tough to watch their defense try to stop Nevada. Good thing for the Mustangs that Nevada's defense will also have issues with Jones' run-and-shoot. If you haven't heard of Theo Scott, check out the Ohio quarterback. (Rightfully) overshadowed by Central Michigan's Dan LeFevour, Scott had a magificent season, and he could be in for a big day against a Marshall team that will take the field with a new coach for this game. With UNC playing a virtual home game, it should be a good atmosphere. The Tar Heels will struggle to stop Pittsburgh running back Dion Scott, a freshman who carried the rock for over 1,600 yards this season. Two things to really watch for here. One, how will USC come out for a minor bowl after seven straight trips to the BCS? Secondly, how will true freshman Matt Barkley handle BC's tough defense? Oh, and there's a third: Can the Eagles move the ball on USC? Two words: C.J. Spiller. The Clemson back and one-time Heisman candidate gets a chance to cut through one more college defense. This could be another basketball game. Jerrod Johnson should have a great day with Georgia's defense, but the Bulldogs can move the ball, too. Plus, it's not like A&M offers up much resistance. Because of a contract, Army gets this spot if they beat Navy on Saturday. The safer bet is that UCLA will make the trip east to play Temple. The Owls sport freshman back Bernard Pierce, who scored 15 touchdowns for Temple. They haven't been to a bowl game in 30 years, and this is their first winning season since 1990. The emerging mid-major bowl lands a great matchup. Wisconsin needs to tighten up on defense, as they were scorched by Florida State in this game last year. It will help that they're much more competent on offense this time around. It's a nice chance for Bucky to help boost the struggling Big Ten's reputation. The Vandals are usually blown out when they play in Boise, but this game could be different. Nathan Enderle leads resurgent Idaho's offense, but they're up against the most prolific receiver in the country in the Falcons' Freddie Barnes. Entertaining tilt between Arizona's dangerous offense and the reincarnation of the Blackshirts defense. Nebraska can hold down any offense in the country, as proven against Texas on Saturday. Toby Gerhart. Enough said. The Heisman frontrunner faces off against an OU team that had a majorly up-and-down season without Sam Bradford. Losses to UTEP, Central Florida, and East Carolina ruined any chance for Houston to be a BCS buster after their stunning win at Oklahoma State in September. Air Force, meanwhile, didn't do anything terribly notable this season, but they just keeping running the ball like crazy and posting winning seasons. The Tigers have Danario Alexander, a top receiver in the country. He could have a big day against Navy's rather undersized defense. The Midshipmen, though, will compete like crazy, as proven by their win over Notre Dame in November. Iowa State wasn't expected to do anything this year, but Paul Rhoads restored pride into that program and got them in the postseason. Watch how they handle the Gophers offense, led by running back Duane Bennett. Minnesota needed a win over I-AA South Dakota State to reach bowl eligibility. Lane Kiffin's team started to make some strides offensively over the course of the season. However, Virginia Tech's defense presents a major challenge for the Volunteers. That said, what should a low-scoring game also features a good UT defense and a scattershot Tech offense. All joking about the Gene Chizik hire aside, he did some good work for the Tigers. The story here is the marvelous job done (again) by Pat Fitzgerald. The Wildcats aren't full of top recruits like other programs, but they're well-coached and always playing smart football. The Tigers never got the defense going as expected, and they will have a devil of an afternoon dealing with Penn State quarterback Darryl Clark. Both coaches -- Joe Paterno and Les Miles -- will have their guys ready after somewhat disappointing seasons. Kudos to all the ACC teams who accepted lesser bowls so Bobby Bowden could coach one more time in a bowl game. This one pits Bowden against his former school, and while it looks like a mismatch, just wait and see how well FSU plays for Bowden in his last game. While much will be made of tOSU's recent BCS failures, the thing to watch here is how Chip Kelly schemes his offense against the Buckeyes' tough-but-vulnerable defense. Jeremiah Masoli could have a huge day if the Ducks can block up front for him. Plus, we all have to watch and see what wild uniform combination Oregon comes up with. Two top offensive minds -- Urban Meyer and Brian Kelly -- will match wits in this game. Kelly has done a good job despite struggles in the run game, while Meyer just lets Tim Tebow be a battering ram when the running backs aren't getting it done. Oh, and this will be Tebow's last college game. The draft hype begins in earnest very soon (if you didn't already think it was bad enough). On paper, the Bulls are way too big and fast for the Huskies. However, USF is just 2-5 after a 5-0 start, and they clearly missed the hell out of senior quarterback Matt Grothe (torn ACL). NIU can run the ball enough to make this very interesting. A late loss to Oklahoma probably cost the Cowboys a BCS berth, while Mississippi has been slipping up regularly since the second week of the season. I hate to rip on Houston Nutt, who generally does really good work, but his teams do this all the time. They slip up when expectations are at the highest. Jevon Snead and Zac Robinson both lead elite spread offenses, so this should be fun. While the up-and-down Gamecocks boast Steve Spurrier, the story here is UConn. They shook off a losing streak that followed the murder of a player (Jasper Howard) to win their last three (including in overtime at Notre Dame) and gain bowl eligibility. It should be close, as the Huskies' five losses came by a total of 15 points. Assuming Bobby Petrino doesn't quit before this game, he will have quarterback Ryan Mallett flinging it all over the field. While MSU is hurt by suspensions, expect the Red Raiders to put up some sick offensive numbers. Kirk Cousins, the accomplished Spartan quarterback, could do some good things in this game, but it's going to be tough with such a bad defense trying to slow down Mike Leach's attack. Duh. This will be fun. That said, I'll have more on this matchup at some point. I can't believe it's happening. I'm such an idiot for saying that Tech's offense would be slowed down. No one slows down Josh Nesbitt and Jonathan Dwyer. They're awesome, and so is Paul Johnson. The test here will be running wide on a really good north-south defense that has its issues defending the perimeter. This is the best mid-major matchup imaginable. LeFevour has been amazing at CMU, and Troy's defense is stout. It's close to home for the Trojans, who should have plenty of fans in Mobile. Mark Ingram virtually carried the Tide past Florida, while Texas had to gut it out against the Blackshirts. How Texas defends Ingram will go a long way toward determining their chances to survive, because you shouldn't expect Colt McCoy to be able to post a ton of points. This is (sniff) the last ballot of the season. We'll throw one more up after the bowl games end, but the regular season is over, no matter what Army and Navy try to tell you. Here is this week's ballot. I believe this is the first time I have gone a week without dropping anyone out of the Top 25. It's no credit to me, only that there were so few games involving fringe Top 25 teams that it was hard to seriously consider moving anyone in or out. The one team I thought about moving in was Nebraska. Full marks to them for the effort against Texas, but it's hard to justify taking anyone off the ballot for a Huskers team that I just don't think is all that good. Cincinnati has been in front of Texas for some time now. Neither team is perfect -- outside of their record -- and neither team would be a serious favorite against a more balanced Alabama squad. The message is simple. The Bulldogs need a 60-minute effort desperately in this game. They fell 20 minutes short Friday, and it cost them in a 4-2 loss. Lapses have been a bit of an issue this season, and they will be again if UMD doesn't clean their overall game up. You know the Fighting Sioux are in town when the scoreboard says "Sioux" at 5 P.M., then "No Dakota" later on. Ah, political correctness ... how nice to see you again! Those were the words UMD men's hockey coach Scott Sandelin used this week to describe the Bulldogs' weekend series against North Dakota. While it's probably too early to overemphasize any games, there's no question that the next four are going to be huge for UMD. At 9-4-1, and within striking distance of first place, the Bulldogs know they have a team that can contend in the WCHA. However, "can" and "will" are completely different animals. For UMD to legitimize themselves, they're going to have to take advantage of some fortunate scheduling. They get a (kind of) banged-up North Dakota team at home this weekend. Denver follows next week for their only two games against UMD this season. From there, the Bulldogs' next WCHA series will be against Colorado College in January, a team UMD needs to get three points from to claim the season series. They can win on Olympic ice (they started the season 1-2-1 on the big sheet). They can win when they don't necessarily play their best hockey. They're capable of taking advantage of some fortunate bounces. This team isn't afraid of anything. It seems they will throw the puck on net as much as humanly possible. They don't need Justin Fontaine and the Connollies to do all the goal-scoring. They can always call on Cade Fairchild. Oops. Most importantly, they seem to have put their disciplinary issues behind them. Now, the Bulldogs are charged with moving forward. The Gopher series is done and gone, almost like it was in a different season. North Dakota is a different animal. The Sioux like to get in your face. You'd think that task would be easier in our sardine can of a rink, but the Bulldogs don't mind it, and they're pretty good at it themselves. Nothing is easy against UND. The Sioux press the play all over the rink, and they're especially tough on the penalty kill. UMD has to be at their best to win either game this weekend. Don't be fooled. The absence of All-American defenseman Chay Genoway will hurt the Sioux, but it isn't a crippling loss. This is a strong and deep hockey team, and they're a tough defensive team even without Genoway. Where they might be hurt is their breakout, and that means UMD has to deploy a strong and persistent forecheck to fully take advantage of Genoway's absence. This is a measuring stick, but it isn't the ultimate one. That said, fans at the DECC will see some very good hockey this weekend. It's pretty special, quite frankly, to see two teams sitting at 11-0 so far this season. This trend is one that can't possibly continue. Don't get me wrong. The Colts and Saints are both rock-solid teams who are deserving of strong records, but they've also gotten lucky. We know at least one of them will eventually lose, and the way Brett Favre is playing, you have to think the Saints are going to have a hell of a time advancing to Miami. Will it happen this week? Can the 1972 Miami Dolphins finally pop the corks? Indianapolis is home for red-hot Tennessee, winners of five straight. This would probably be a better upset special if the Titans were 2-9 or something, but instead they're on fire, people have noticed, and the Colts should be ready. The Saints play a game that has "letdown" all over it, as they travel to Washington. The Redskins are coming off a couple very tough losses, and they're generally terrible. It's just the kind of team that can be overlooked, no matter how strong a speech the head coach gives about not overlooking the opponent. Be afraid, Saints fans. Be very afraid. The IIHF World Junior Championships are set for Dec. 26-Jan. 5 in Saskatchewan. Last year's tournament was a disappointing one for the United States, as they lost a preliminary-round game to Canada by blowing a 3-0 lead, then bowed out to Slovakia (!?) in the quarterfinals. To get back on the medal stand, USA Hockey called on an old friend for this year's tournament. Former North Dakota and current Nebraska-Omaha coach Dean Blais has plenty of international experience, and he is very good with young players. Canada is the defending champion, and they're again playing on home soil (it was in Ottawa last year). No pressure, guys. Both countries announced preliminary rosters this week, and both have NCAA players at least in position to make the final rosters. In Canada, UMD freshman defenseman Dylan Olsen is on the preliminary roster. A first-round pick of the Blackhawks this past summer, Olsen has eight assists in 12 games for UMD. 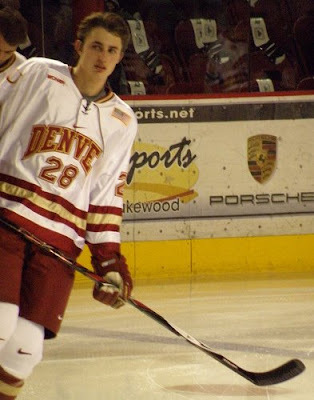 He is joined by Denver sophomore defenseman Patrick Wiercioch. It was inconceivable to me that Wiercioch didn't make the team last year, and he should have a pretty good shot this time around. Wiercioch has 14 goals and 45 points in 49 career games with the Pioneers. The Canadian World Junior camp is Dec. 13-15 in Regina, Sask. According to sources, both players are expected to miss the Denver-UMD game at the DECC on Dec. 12, as they make their way north for the camp. Harvard freshman Louis Leblanc is the only other college player on the Canadian roster for that camp. On the U.S. side, a preliminary roster of 29 will be whittled down during a camp scheduled for Dec. 15-19 in Grand Forks, N.D. UMD recruit Justin Faulk -- now with the U.S. National Team Development Program -- is on the roster, as are a number of current college players. Minnesota's Jordan Schroeder will play in his third World Juniors, and Wisconsin (Derek Stepan, Jake Gardiner, John Ramage), North Dakota (Danny Kristo), and Denver (Matt Donovan) are also represented on the preliminary roster. As the prep football season closed out at the Metrodome, high school hockey got underway. It really gets going this week, as pretty much everyone we cover will have a game under their belt by Saturday. Most will have played earlier than that, and some have already gotten in a game or two. Similar to football, I have set up a Google spreadsheet to keep track of the teams in our three area sections in Minnesota (Sections 5A, 7A, and 7AA), as well as the two that cover northern Wisconsin (Section 1 and Section 2). As we speak, all Minnesota teams are in, and I am working to get all the Wisconsin teams done as the season starts. Please e-mail me with any information you believe to be incorrect, or if you can help provide anything we are missing. Ahead of that, here are my snap judgment rankings for each of the sections. One year ago today, I found out my position at Midwest Communications was being eliminated. After a few head-spinning days, the process of getting back on the ol' feet began, and I'd like to think we're in a better place now than we were then. I'd miss people if I tried to thank all the individuals who played a role in helping me cope with what happened. Obviously, my wife, Tammy, was a rock, and my immediate family and friends are all to be thanked with words I cannot come up with. Same goes with all those who e-mailed words of support and encouragement after that happened. I thank my lucky stars every day that I have people who cared that much about me. Anyway, I felt the need to acknowledge the one-year anniversary. I also want all of you to know how seriously appreciated you are.